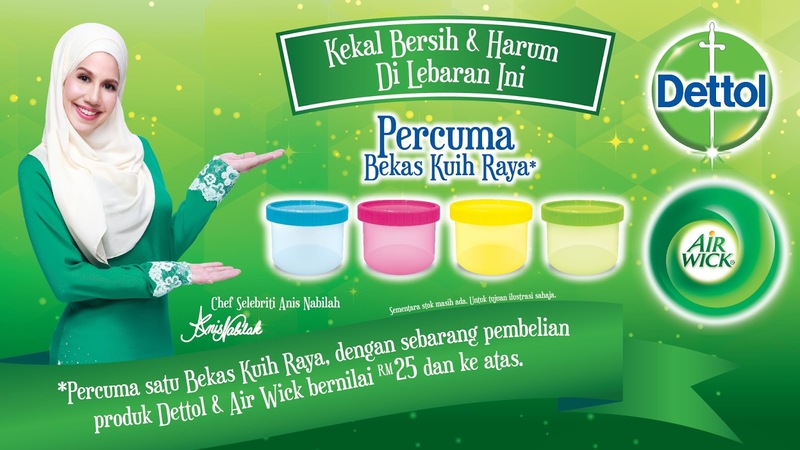 Get Raya-Ready this Ramadan with Dettol and Air Wick!! Assalamualaikum n hi everyone... Ramadan will be coming in a few weeks time. Time flies so fast, and I even realized I didn't finished repay my last year fasting debt. Its that even a corect word? Hahaha..
What ever it is while Ramadan is a holy month where Muslims observe fasting and count their blessings for being fortunate, it is also a time when Malaysian families make preparations for Hari Raya. From cleaning the house to shopping for new clothes, to planning the menu for breaking fast and even squeezing in time to bake some yummy cookies -- it’s all part and parcel of this busy month. Understanding this, Dettol and Air Wick are here to ensure you stay germ-free and protected before you cook up a storm during this festive period and at the same time, you can welcome your loved ones with a great-smelling home, especially after a Raya cookout! Imagine a pop of colours to spruce up your living room when you’re receiving guests. Throughout May and June 2017, simply spend RM25 and above on Dettol and/or Air Wick products in a single receipt, and redeem an exclusive Raya cookie container to store all your favourite nibbles in. You can purchase any Dettol and Air Wick products to collect all four colours of the Raya cookie containers to add joy to your home! They are available at major pharmacies, supermarkets and hypermarkets in Malaysia. But don’t just stop at the bright and cheery cookie containers. Go to Dettol Malaysia Facebook Page to get the Special Recipe Collection from Chef Anis Nabilah, and join our online contest to stand a chance to bake with Chef Anis in person! Having helmed a string of successful cooking shows from the likes of Eat Clean with Anis on Astro Bella and 1, 2… Bakar! on TV3, she’s known for her versatility in both Malaysian and international cuisines. With the same purchase of Dettol and/or Air Wick products worth RM25 and above, submit your entries on Dettol Malaysia’s Facebook Page (www.facebook.com/DettolMalaysia) and who knows – you might just be one of the 8 winners to bake alongside Chef Anis Nabilah! The contest runs from 1st to 14th May 2017, so don’t miss out your chance to bake with the celebrity chef. Dettol’s online contest is available with Dettol’s participating retail partners – Mydin, Econsave, Giant and Tesco. “Reckitt Benckiser always strive to delight consumers with innovative, effective products that help make healthier lives, happier homes. With Dettol and Air Wick as well as Chef Anis Nabilah’s Special Recipe Collection to celebrate Ramadan this year, we really hope that we can help to create a special bond among Malaysian family members.” continued Tang. We wish all Raya celebrants a peaceful and blessed Ramadan with Dettol’s germ-free protection and Airwick’s scent for the home. For more information on the campaign, go to Dettol Malaysia Facebook starting May onwards. Dettol has been a trusted antiseptic brand since 1932 and is the world's well-known brand of antiseptics and a trusted champion of family health. Dettol products offer a high standard of germ kill and are recommended by healthcare professionals for their proven ability to keep families healthy. The brand has stayed contemporary through the launch of new products and offered consumers a breadth of products across categories that can help protect them from germs. These include shower gels, bar soaps, hand sanitizers, liquid hand washes and antibacterial wet wipes. Dettol is a trusted brand among mothers to keep her family members protected all day long. Air Wick began offering home fragrance products in 1943 in the United States. As the brand grew, it then expanded in 1953 to reach homes in Europe, Canada, and Australia. Today, Air Wick products are available in more than 60 countries including Malaysia. The brand offers a wide range of home fragrance solutions, including electrical plug-ins, automatic sprays, instant sprays, aroma gels, and more. The home scents are just as diverse, ranging from floral to fresh linen, lavender, citrus, and more. Air Wick ensures home to always be fresh, inviting, and a reflection of each individual personality.